Yet see his lasting monuments. One of the country’s less-remembered military men, at least in this century, is General Winfield Scott, known as “Old Fuss and Feathers” because of his adherence to military decorum. Born in Virginia, Scott participated in the War of 1812; the little-known Black Hawk War, a land dispute between the Sauk Indians led by Chief Black Hawk in Illinois and the Michigan Territory, now Wisconsin, 1832 (hockey’s Chicago Blackhawks are named for him); the Mexican War (1846-1848); and the Civil War (1861-1865). Scott (1786-1866) is regarded by many historians as the United States’ greatest general; he was in uniform for 53 years, serving as a general longer than any other United States military man. He oversaw the forced relocation of the Cherokee known as the “Trail of Tears” in 1838 even though he disagreed with then-president Martin Van Buren, about his policy of relocation. In 1852, Scott won the Whig nomination for the U.S. presidency, but lost to Franklin Pierce, an ancestor of Barbara Bush, spouse of 41st President George H.W. Bush. Scott lost by 254 electoral votes to 42, and as a result, the Whig Party forever lost prominence as an alternative to the Democrats, and was soon replaced by the fledgling Republican Party, with Abraham Lincoln capturing the White House two presidential elections later, in 1860. Twelve years before the 1852 election, in 1840, Scott had also vied to be a presidential candidate for the Whigs, opposing William Henry Harrison and Henry Clay. Harrison eventually won the nomination and the presidency, but died after just one month in office. During nomination balloting in New York in December 1839, Clay had blamed Scott for his loss because he did not withdraw and throw his support to Clay; Clay struck Scott on a shoulder weakened by an injury he had received in Niagara Falls during the War of 1812. Scott challenged Clay to a duel, but Clay later apologized. Scott found himself back in action, of a sort, in 1861, as the Civil War broke out in 1861. By then he was 74-years-old and weighed 300 pounds, and judged himself unfit for on-field combat. He selected Robert E. Lee to lead the US Army, but Lee demurred, as he did not want to take up arms against his home state Virginia. Scott fired Lee, who went on to lead the Confederate armies. Scott, a New Jersey and New York City resident for a time, is remembered in no less than three NYC boroughs by former residences, neighborhoods, and monuments. 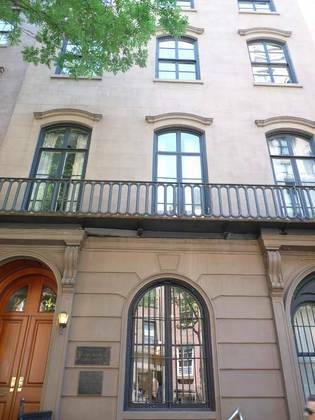 Scott and his wife resided at this townhouse at 24 West 12th Street in Greenwich Village from 1853 to 1861, between Presidential defeat and the Civil War. The house was designated a National Historic Landmark in 1973; the Italianate house was new when Scott moved in. After Scott’s death the house was owned for several years by socialite and art collector Abby Blodgett. During the 20th century, individual rooms were eliminated and the townhouse became home to cultural offices. Upon his arrival in New York, Scott, who was a prominent figure after leading troops in several wars and running for President, was a celebrity. A pair of developers, G.G. Andrews and J.F. Kendall, purchased some land in 1854 north and south of Woodside Avenue in Queens on either side of what is now the Brooklyn-Queens Expressway and called their new development “Winfield.” Along with new housing, the new town hosted manufacturers making such disparate items as coffins, sewing machines and much later, airplane parts. The present Catholic parish of St. Mary’s was founded in 1854 along with the neighborhood. There was also a short-lived Winfield Long Island rail road station. In the 20th century, Winfield was absorbed into Woodside, to its west, and Elmhurst, to its east. Today, its own really tangible remnant is the Winfield War Victory Memorial, where the Brooklyn-Queens Expressway crosses 65th Place at Laurel Hill Boulevard. The war memorial was crafted by Italian sculptor James Novelli (1865-1940) and honors seven soldiers from Winfield who perished in World War I. 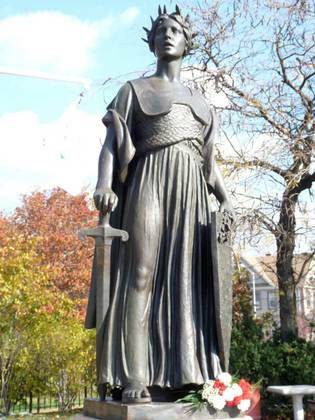 Dedicated in 1926, it depicts an allegorical representation of Victory wearing a laurel crown and carrying a sword in her right hand and a shield on her left. On the marble stele she stands upon is carved the names of the seven Winfield heroes. After being struck by a vehicle in 2001, the statue was absent for 10 years. It was rebronzed and replaced with protective bollards. It’s unknown if “Old Fuss and Feathers” ever visited his namesake Queens town. We do know that John Jacob Astor never visited Astoria–neither the one in Queens, nor the one in Oregon. Scott’s other remaining memorial is deep in the heart of Riverdale, in the Bronx, at the confluence of Riverdale Avenue and the Henry Hudson Parkway. The Riverdale Memorial Bell Tower was designed by Dwight James Baum, who was the architect behind many Riverdale residences. The monument lists local Riverdalers who perished in World War I and was completed in 1930. 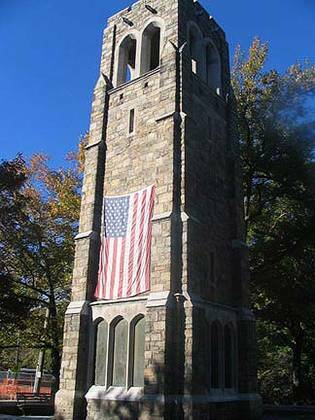 The tower was constructed explicitly to host a bell cast in Spain in 1762 and used in a Mexican monastery until Scott captured it during a Mexican War campaign. The bell was originally placed in the Jefferson Market bell tower, since replaced by the Gothic tower at 6th Avenue and West 10th Street, and then a now-demolished Riverdale firehouse.